Jim Ross will go above and beyond to make your boat purchase the best experience you can have. Jim was prompt to answer any questions we had and kept us up to date on exactly what was happening in the purchasing process. He helped us navigate the survey process and even came along for the survey to make sure everything went as planned. Without his help, I know there is no way that we could have closed on the boat in just 35 days. 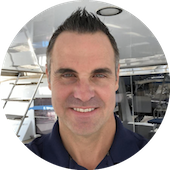 Jim will go above and beyond to make your boat purchase the best experience you can have.